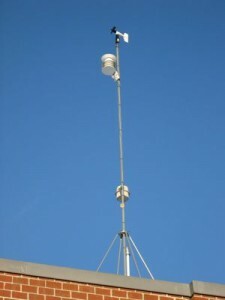 In September 2004, a WeatherBug weather station was installed on the roof of the new Alcott School. Located in the rear of the building, this weather station was purchased through a Concord Education Fund grant. In 2005, through the generosity of the Alcott PTG, we were able to renew our subscription to WeatherBug for the lifetime of the weather station. WeatherBug was founded in 1992. They deliver live, local weather conditions to millions of consumers via the Internet. They also broadcast live weather data to more than 100 state and local government agencies, including the National Weather Service, television stations, schools, and businesses. The Alcott weather station tracks temperature, humidity, rainfall, barometric pressure, wind speed, wind direction, and wind gusts. This live data is used in many first and fourth grade classrooms as part of their Earth Science unit of study. To view the current weather conditions at the Alcott School, please click here for a live display or here to access the data directly on the WeatherBug website. Students can login here using Concord’s ZIP code to access the WeatherBug Achieve website. On this site there are many activities and tools that complement the science material students are learning in the classroom.